Home > ZH > Venezuela: What A Disaster! Food shortages, rising prices, inflation, corrupted incentives, and rampant crime are all symptoms of a primordial problem: socialism. Just because the Socialist Party was democratically elected does not mean that the economic calculation problem has been solved. It’s as if the gods needed one more example to shove down the throats of Western leftists. Economic chaos, food rationing and a complete break down of the social order aren’t lessons of a misguided dictatorship of the proletariat, but a fundamental reality of socialism, whether democratic or not. Democracy is just an insidious form of communism and the Venezuelan December 6th legislative elections won’t likely loosen the power the Socialists hold over the judiciary and government watchdog agencies. But since street protests led to more state violence, the Venezuelan people have retreated to a electoral solution. Like Canada, where government workers prefer to vote for the party that offers more tax-funded goods, it’s assumed that in Venezuela, the government-controlled TV and radio stations will convince enough people to vote for the Socialists. Pollster Luis Vicente Leon said that over 16 years in power, first Chavez and now[President Nicolas] Maduro have mastered the electoral arts. 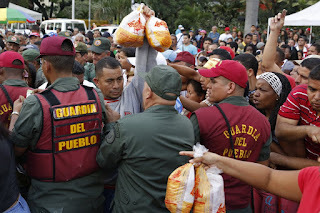 “They fiercely control the institutions and the money which allow them to become stronger through electoral engineering even when their support is flagging,” Leon wrote in the Caracas daily El Universal.